You may want to send e-mail from Thunderbird using your @ulyssis.org-address, or another domain name that you use for your account. Thunderbird allows you to do this, but to configure this properly, you should not use your provider's SMTP server. They will add an extra header stating the original e-mail address the e-mail is sent from. Some e-mail clients show this information, which might be unwanted. 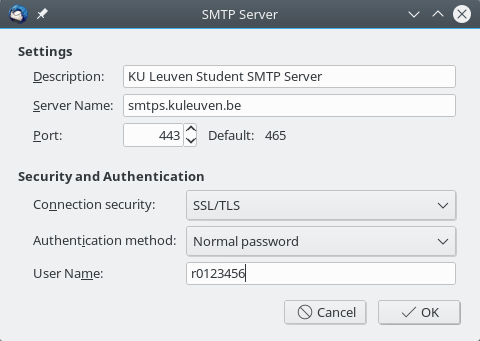 The KU Leuven also provides an SMTP server which you can use as a student. It accepts e-mail originating from any e-mail adress, and can therefore be used for this purpose. It should be noted that this is an authenticated server, so any potential abuse can be tracked back to you. You should not use this for any malicious purpose. 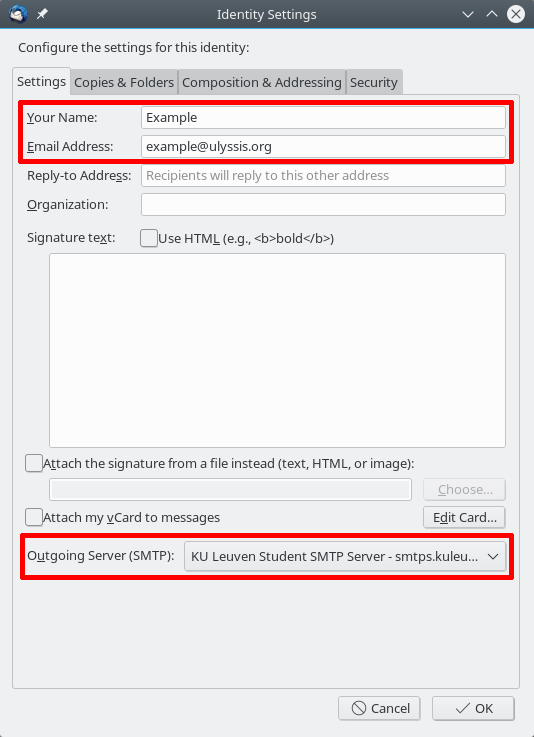 If you already have set up your KU Leuven e-mail in Thunderbird, you can skip this step and proceed to #Configure an identity for your e-mail account below. Go to your Account Settings (Edit > Account Settings or Tools > Account Settings, depending on your operating system). At the bottom of the left sidebar, you will find an entry named Outgoing Server (SMTP). Click this to access your SMTP settings. In your SMTP settings, you should see a list of existing SMTP servers. We want to add a new entry, so click the Add... button. In the screen that pops up, fill in the settings as in the example screenshot below. Replace the displayed user name with your own student number. You will have to fill in the corresponding password on first use. Back in the Account Settings screen, click on your e-mail address (not on any of its children). In the screen that opens, there will be a button Manage Identities... at the bottom. Click it. In the new screen, there will be one existing identity already: the default identity corresponding with your normal e-mail address. We want to add a new identity, so click the Add... button. In the screen that pops up, fill the name and e-mail address you wish to use. At the bottom, make sure you choose the SMTP server of your student account. This is shown in the image below. When you compose a new e-mail, you can change the sender in the "From" field to the identity you just configured. If everything was installed correctly, Thunderbird will show you a pop-up to enter your KU Leuven password when you try to send the e-mail. In this pop-up, you can choose to save this password for later use.